For more than four centuries, new ideas, principles, and events have caused major conflicts in American history - concerning such vital issues as slavery, freedom, democracy, immigration, and equality. It is through these very conflicts that American history is taught, and increasingly, this history is being taught through documents. From introducing slavery and breaking away from England in the colonial period to the Civil War in the 19th century, the civil rights movement in the 20th century, and the war in Iraq today, every era has been marked by conflicts in which Americans have fought passionately for what they believed in. All of these conflicts have defined what America is, and all of them can be studied through historical documents. 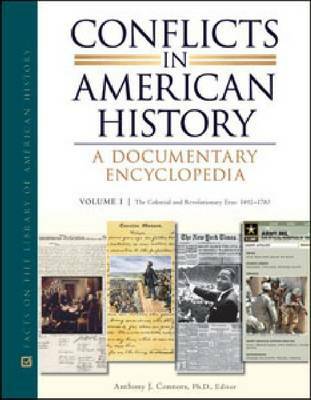 ""Conflicts in American History: A Documentary Encyclopedia"" explores the conflicts, controversies, and ideas that have made American civilization unique and distinctive. Blending narrative essays and primary sources, this new, comprehensive eight-volume encyclopedia provides students with the background they need to understand American history and the skills required to read and interpret the important documents that have shaped our nation. Each volume focuses on one distinct chronological era and the conflicts that defined it. Consisting of 15-20 manageable chapters, with each chapter devoted to one specific conflict and containing 10-15 original documents, every volume begins with a general overview essay that introduces the major conflicts, issues, and controversies of the period, as well as key figures and events. A chronology and a bibliography are included in each chapter. Each volume of the encyclopedia features approximately 250-350 original documents, a master bibliography, and a lengthy appendix with biographical sketches of 50-100 individuals mentioned in the documents or central to the period. A master index is included for the entire set in the final volume.